This recipe may look a little familiar to regular visitors to my blog. I'm reposting it for the No Waste Food Challenge on Kate's blog 'Turquoise Lemons'. "I needed a little sweetness in my life yesterday and didn't have a lot of time, so thought that muffins would fit the bill. There were bananas in the fruit bowl, looking nice and ripe and calling out to be used before the grocey delivery arrives (today). I thought I'd look and see what Betty Crocker had in the way of muffin recipes and sure enough there is a nice quick recipe for Banana Muffins." 1. Heat the oven to 200C. Grease the muffin pan or line with paper cases. 2. In a large bowl beat milk, egg, oil and banana with a fork or wire whisk until well mixed. 4. Bake for 20-25 minutes or until golden brown. 5. Make the topping: melt the butter, add the sugar then brush the mixture over the warm muffins. 6. Put the chopped walnuts on a plate and dip the sticky top of the muffin in the nuts. 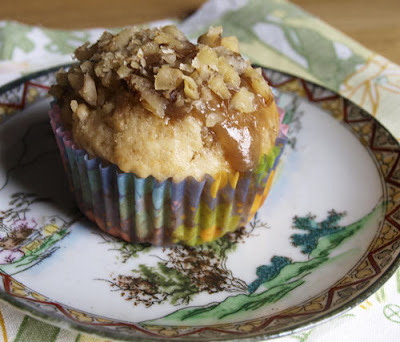 I can thoroughly recommend these muffins, they are quick and easy and taste delicious. nothing wrong with a re-post of a very good bit of baking! Ah yes the spotty banana challenge, I will be entering that too! LOVELY wee buns Janice! What a great way to use up spotty bananas. I always put mine in Smoothies which the kids then refuse to drink, because it contains old bananas! Must of missed these guys the first time around - they look fantastic. Sure wouldn't last long in this house! I always have bananas that need using up so will make these now. Love the topping on the muffins, great touch! I think it's the toffee topping that really makes these buns special. I don't mind old bananas but hubby hates them!